Shijiazhuang - On a windy afternoon, a gray-haired man carrying a shovel and pickax shuffles on crutches to the foot of a hill. There is no path through the protruding white rocks. The man sits down with his back against one of the stones, puts his crutches aside and detaches his artificial legs. Wearing ragged gloves, he begins pulling himself up the hill. Twenty minutes later, he reaches a small flat area. Unloading his tools, he deepens a hole he dug the day before and plants a Chinese parasol tree in it. Then he crawls to an inlet nearby to water it. Over the past 10 years, in this slow, methodical way, Ma Sanxiao, a 63-year-old legless veteran, has planted more than 3,100 trees in the hills in Jingxing county of Shijiazhuang, capital of North China's Hebei province. "I got blood poisoning and received treatment when I was in the service in Fujian province in 1974. It got worse after I left the army so I had to amputate my right leg in 1985 and my left in 2005," Ma said, patting his legs with a sigh. Seven major operations and constant medicine have drained his savings. A television and two wheelchairs are the only possessions in his one-story house that might remind one of any modern lifestyle. But Ma won't allow himself to remain idle, although as a veteran he gets a 400-yuan ($62) subsidy from the local government every month, enough to cover his basic living costs and medicine. "I was a soldier and a fighter. I can't lie in bed waiting for help," he said firmly. In 2001, inspired by another tree-planting story on TV, Ma decided to follow suit. He gets up at 5 am every day, then goes on crutches to the nearby hills. Because it would waste time to eat at home, he usually takes prepared food with him, such as steamed buns. Ma said he cannot remember how many times he has fallen down the hills or into trees over the years. Once, he even lost the little finger of his right hand. "I fell down into a ditch when I was on the way back in the dusk in 2005. The skin had been scratched. But gradually the whole finger became rotten due to my illness. So I had to cut it off before the rest got infected," he said, showing his palm casually as if he was talking about others. 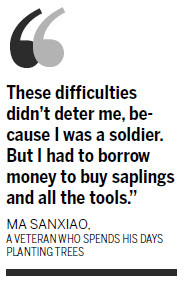 "These difficulties didn't deter me, because I was a soldier. But I had to borrow money to buy saplings and all the tools. I can't count the broken shovels I used in those years. " Things started to change early this year when a casual passer-by captured Ma's story and uploaded it online with a video. 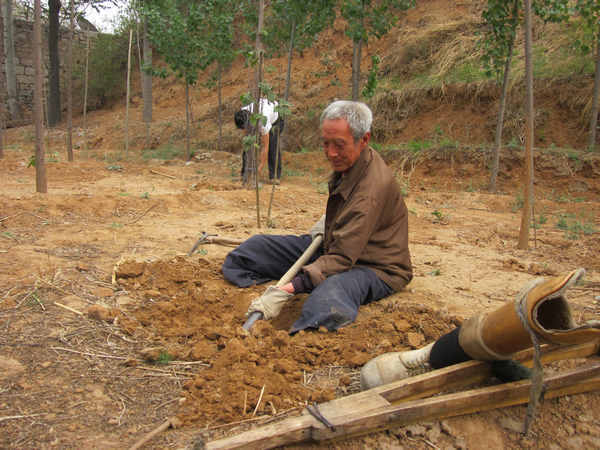 Ma found he was no longer the only one planting trees in this remote mountainous village, which is about a three-hour bumpy drive on a rugged road from Shijiazhuang. More and more volunteers have come and joined him, bringing saplings and tools, in addition to their company. "More than 30 volunteers have come this year. I greatly appreciate their help," Ma said, while digging a hole for another tree. He brushed off the praises those volunteers have given him. "Honestly speaking, making a living out of planting trees was also part of my idea at first. You know, I can sell them to make money and stand on my own feet financially," Ma said. "But as the trees grew bigger and started to wrap the hills in a beautiful green, I became hesitant. They are not only beautiful, but also important to those hills because they can hold the soil." So Ma has held on despite the frugal life he leads. "I'll never sell these trees," said the determined veteran, looking at the trees he planted on the opposite hills, smiling. But there is also a sad part of the story, Ma admitted. "You know, the most terrible thing for me is to see my trees die. The ones I planted a month ago have died," he said, referring to the recent drought that has killed the trees. "About 100 trees of the 430 trees I planted last year died. Who can save my trees?" the former soldier continued, and cried.